A man who goes by the assumed name of Martin David and who is hunting for the last Tasmanian Tiger stays at the home of a young family grieving the loss of their missing father on Tasmania's Central Plateau. 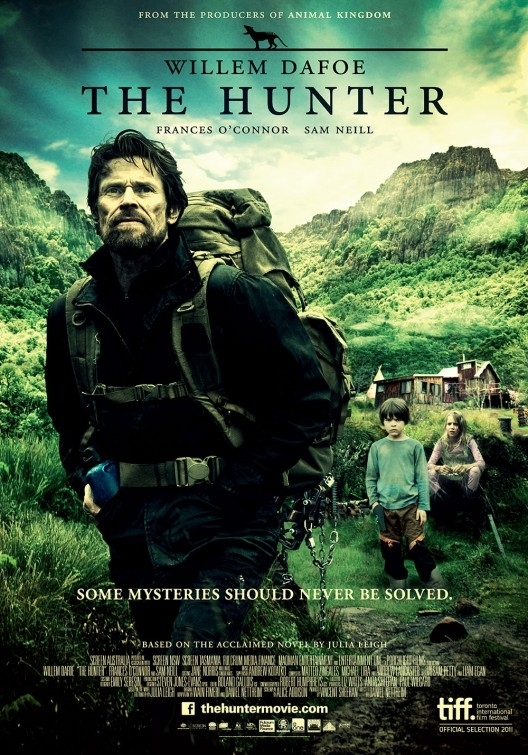 Julia Leigh's The Hunter was adapted to film in 2011. The film was written and directed by Daniel Nettheim. The novel is set in a remote area of the Central Plateau above a former logging town. The novel features beautiful descriptions of the landscape and a lake that is probably near Julian Lakes, high on the Central Plateau. The novel begins with the protagonist, M, arriving at Launceston airport and driving south-west out of town through what is probably Longford, or even Deloraine (one of the filming locations) toward his destination: a small bluestone house at the base of the Central Plateau in the Tarkine. Tiger Creek is a fictional setting, but there is a real Tiger Creek southeast of the narrative setting in the Butler’s Ridge Nature Reserve and the Arthur-Pieman conservation area. The fictional Tiger Creek is located near Sassafras Hill, which M passes through on his way from Launceston to the the Central Plateau. The girl in the novel calls herself Sass, short for Sassafras. In addition, there is also a Tiger Road near the town of Sassafras, situating the fictional location within actual landmarks and regional locations.